With one week of competition remaining before the 24-team FCS Playoff field is revealed, all of a sudden there’s a three-way tie atop the Big Sky Conference. No. 5 Eastern Washington dismantled No. 6 UC Davis 59-20 in Cheney while No. 3 Weber State beat Southern Utah 31-18 to create a three-way tie at 6-1 in league play at the top of the Big Sky standings. Cal Poly posted a 37-14 upset over No. 24 Idaho State, likely pushing the Bengals out of the playoff picture. North Dakota rallied for a 17-10 win over Portland State to sit at 6-4 entering the final week of the regular season. Montana raced to a 36-6 halftime lead in a 46-27 win over Idaho while Montana State posted a 35-7 win on Senior Day at Bobcat Stadium over Northern Colorado as both Treasure State schools stayed alive in the cloudy playoff picture. Northern Arizona’s trip to Sacramento State was cancelled due to poor air quality stemming from the wildfires raging in California. Eastern Washington finishes its regular season at Portland State in the Battle for the Dam Cup. Weber State plays Idaho State, Cal Poly plays at Southern Utah, North Dakota plays at Northern Arizona and Sac State plays at UC Davis in the 65th Causeway Classic. Idaho plays at Florida. Montana hosts Montana State in the 118th rendition of the fiercest rivalry in the FCS. 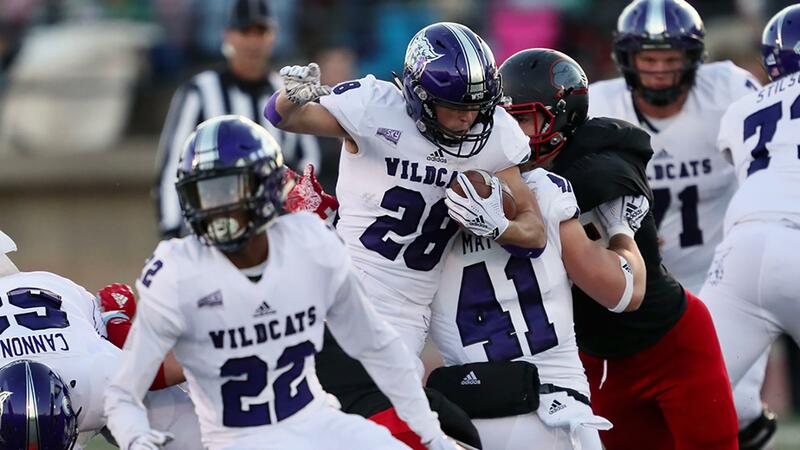 CEDAR CITY, UT – Third-ranked Weber State won its fifth-straight game to further solidify its FCS playoff resume. The win moves Weber State to 8-2 overall and 6-1 in Big Sky play. The Wildcats will claim the Big Sky title and the automatic berth in the FCS Playoffs with a win in the season finale next Saturday at Idaho State. Wildcat freshman Josh Davis rushed for a career-high 225 yards and two touchdowns and Weber State had 445 yards of total offense in Saturday’s win. Weber State jumped out to a 14-6 lead early in the second quarter after a 44-yard touchdown run by Josh Davis. SUU’s Judd Crockett returned the ensuing kickoff 100 yards to make it 14-12 Wildcats. WSU came back with a nine-yard touchdown run by Clay Moss that made it 21-12 at halftime. Davis started the second half with a two-yard touchdown run that gave the Wildcats a 28-12 lead. SUU scored on a one-yard touchdown run to make it 28-18 after three quarters. Trey Tuttle added a 35-yard field goal that up the ‘Cats up 31-18, and the Wildcats held on for the win. It was WSU’s third-straight win in Cedar City. Davis had his sixth game reaching 100 yards and his second game surpassing 200 yards in a game this season. He also became the 10th Wildcat in history and just the second freshman ever to rush for 1,000 yards in a season. He now has 1,160 yards and eight touchdowns on the year. Quarterback Jake Constantine finished 207 yards passing and one touchdown. Auston Tesch led the Wildcat defense with 10 tackles, while LeGrand Toia added seven tackles with a sack and two tackles for loss. WSU totaled four team sacks and nine tackles for loss. Weber State will wrap up the regular season next Saturday with a chance to secure the BIg Sky title when they play at Idaho State at 2:30 p.m. in Holt Arena. The one thing the Eagles and Aggies could agree upon is that to be the best you have to beat the best. The No. 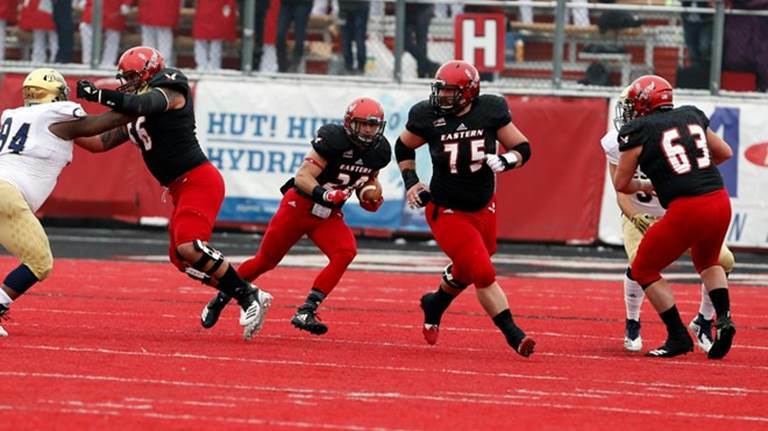 5/3 Eastern Washington University football team scored 59 of the game’s last 69 points to blow past No. 4/7 UC Davis 59-20 in a Big Sky Conference showdown of teams ranked in the top five nationally on Senior Day and Military Appreciation Day on Saturday (Nov. 10) at Roos Field in Cheney, Wash. 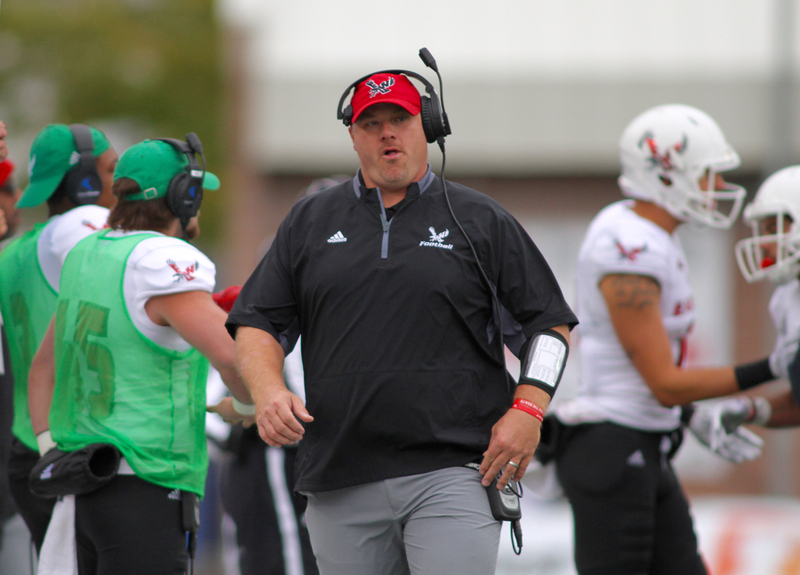 The victory moves EWU into a first-place tie in the league, and Eastern is one win away – next Friday at Portland State — from the school’s 10th Big Sky Conference title and a 13th berth in the NCAA Football Championship Subdivision Playoffs. Eastern finished with a dominating 669-395 advantage in total offense after spotting the Aggies the first 10 points of the game. Sophomore quarterback Eric Barriere accounted for 345 of the yards with 285 passing and 60 on the ground. He had a touchdown pass, but EWU rushed for six TDs and 372 yards – the fifth time the Eagles have had at least 300 this season. It was just the seventh time Eastern has played a top 5 matchup in the NCAA Football Championship Subdivision, including just three in the regular season. It came on a cold and foggy 30-degree day at sold-out Roos Field. A crowd of 8,789 were on hand for EWU’s 30th-consecutive sellout and 42nd in school history. The offensive total was the sixth-best in school history, and EWU scored at least 50 points for the 59th time in school history and the fourth time this season. Eastern had just one turnover and forced five, including interceptions by seniors Josh Lewis and Nzuzi Webster, and one on the last play of the game by sophomore Calin Criner. 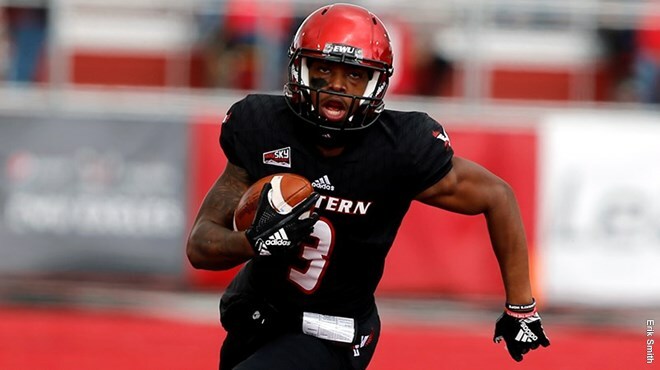 Webster returned his 45 yards for a key touchdown in the third quarter, and his twin brother Nsimba Webster was EWU’s leading receiver with three catches for 103 yards. It was a fitting send-off for 27 Eagle seniors in their final regular season game at Roos Field. Aside from two long touchdown runs of 46 and 69 yards, the Eagle defense allowed UCD into the red zone just once all day, and the Aggies had to settle for a field goal. Eastern’s defense finished with 13 passes broken up, five quarterback hurries and six tackles for loss. Eastern remained fifth in this week’s STATS NCAA Football Championship Subdivision Top 25 poll, but moved up a notch to third by the coaches. Right with the Eagles are Weber State (3/4) and UC Davis (4/7). Earlier this season Eastern had its highest rankings in four years when it was fourth by STATS and third by the coaches prior to falling at Weber State. Idaho State, averaging 524 yards in total offense per game entering Saturday’s contest, was held to 367 yards in falling to 6-4 and 5-2. Protheroe surpassed the single-season mark of 1,578 yards set by James Noble in 2005 as he now has 1,627 yards with one more game to play. He also is within reach of the career mark of 4,205 yards set by Craig Young from 1996-99 as Protheroe has 4,088 yards and needs just 118 to break the mark. Protheroe (pictured at right), who carried the ball 41 times, two shy of his career high, scored on a one-yard run late in the second quarter, giving Cal Poly the lead for good at 13-7. 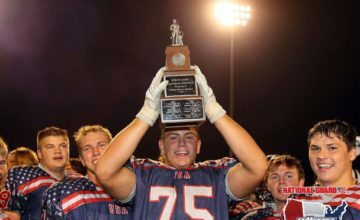 The Mustangs added three touchdowns and a field goal in the second half to win going away. 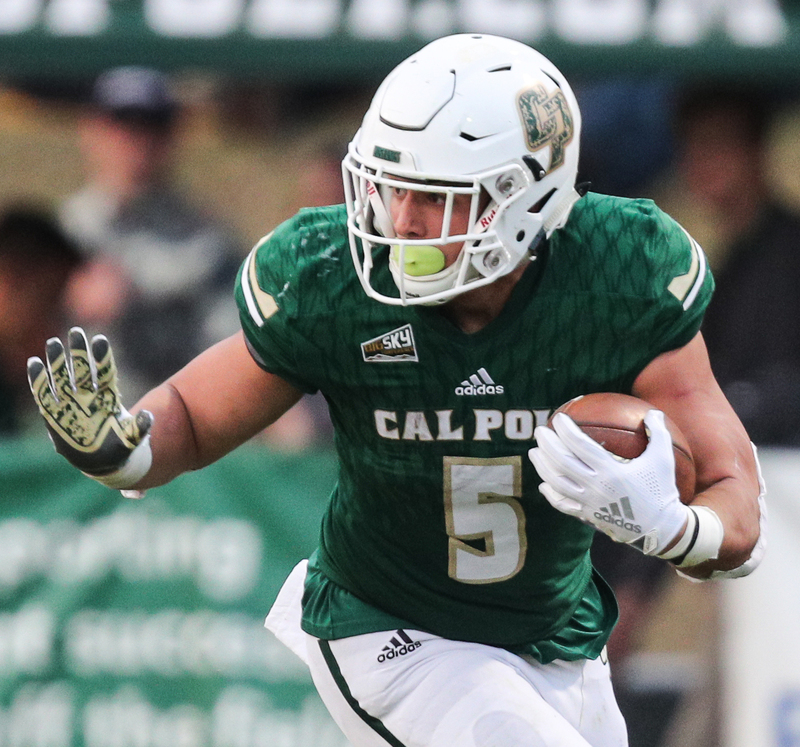 Turner’s fumble recovery and run for a touchdown was Cal Poly’s first since Kenny Jackson scampered 32 yards for a score against Dixie State in 2009. It also was the first score by the Mustang defense since Kelly Shepard’s interception return against San Diego in the 2016 FCS playoffs. Idaho State’s only scores were an 11-yard pass from Tanner Gueller to Michael Dean in the second quarter and a 28-yard run by Ty Flanagan midway through the third period. Idaho State was ranked for the first time since 2015. The Bengals are 4-0 at home this season but 2-4 on the road. With Saturday’s win, the Mustangs have won five straight games at home against Idaho State and now hold a 14-8 advantage in the series. Grand Forks, ND – Portland State dominated the second half on the stat sheet, but turnovers played a huge role in the outcome. The Vikings, leading 10-7 at the start of the fourth quarter ended up losing, 17-10, at the Alerus Center. With the Vikings at midfield and driving, quarterback Davis Alexander was picked off on the first play of the fourth quarter and the ball was returned for a touchdown. On PSU’s next drive the UND defense knocked the ball out of Carlos Martin’s hands inside the Fighting Hawks’ 30-yard line. Those two turnovers stopped PSU’s two serious threats in the final quarter. Portland State had 300 yards of total offense, while the defense had another excellent performance, holding the Fighting Hawks to 222 yards, including only 58 after halftime. But the 3-1 turnover differential hurt the Vikings in the end. “Great job by our defense,” said Viking Coach Bruce Barnum. “It was a defensive struggle and we couldn’t get enough points. When we did get it rocking and rolling we had a couple of turnovers. The loss dropped the Vikings to 4-6 on the season, 3-4 in the Big Sky Conference. North Dakota improved to 6-4.